Carolina Day School is pleased to announce that this year’s Distinguished Alumni Award honoree is Pam Turner, alum of CDS predecessor school, St. Genevieve-of-the-Pines. Being a Wildcat runs in Pam’s family. Her children, Brian and Robin, attended Asheville Country Day School then both graduated from Carolina Day School after the 1987 merger of the schools. 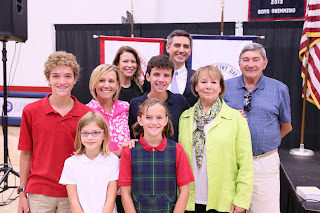 Now, her grandchildren, Harrison, Carson, Riley, and Eleanor attend Carolina Day School. The C. Robert Bell, Jr. Distinguished Alumni Award recognizes alumni of Carolina Day School and its predecessor schools who have distinguished themselves, their school, and their community through personal accomplishments and service to others in their business, profession, or vocation and who have demonstrated concern for and service to their community, state, nation, or world. Out of 11 nominees, the Alumni Board voted unanimously to honor Pam Turner. Pam is on the steering committee for the It All Begins Here capital campaign to renovate the Lower School and build a new Library, and has been a supporter of all CDS campaigns over the past 20 years. In addition to her work with Carolina Day, Pam has supported other area nonprofits including the Asheville Arts Alliance (now the Asheville Area Arts Council), the Preservation Society of Asheville and Buncombe County, The Health Adventure, RiverLink, the American Red Cross, and the United Way of Asheville and Buncombe County. Pam has also been honored as a recipient of the United Way of Asheville and Buncombe County's Lifetime of Dedication to Charity and Volunteerism award.